VietNamNet Bridge – The Ministry of Health has concluded that the mysterious disease which has affected 215 people in central Quang Ngai Province's Ba To District was caused by Aflatoxin, a toxin produced by fungus in mouldy rice. Last Thursday, at Lang Reu Village in the district's Ba Dien where the disease started to rise, investigators took samples of rice from families of those infected. Deputy head of the ministry's Preventive Medicine Department, Phan Trong Lan, said tests showed that 100 per cent of those affected in Ba To and Son Ha District ate mouldy rice which was contaminated with the toxin nine times higher than the safe level. Lan urged residents not to eat mouldy rice or rice stored for a long time. The toxic agent causes liver cancer in men, he said. Ministry investigators also surveyed the residents' rice-eating habits. Deputy head of the Pasteur Nha Trang Institute, Vien Quang Mai, said local awareness of health safety and personal hygiene has been raised. Residents dried grain before use but storing it in their timber barns did not preserve the rice's quality due to moisture. At a meeting on Saturday between leaders of the provincial People's Committee and the two districts and relevant authorities to discuss preventative measures, deputy chairman of the committee, Le Quang Thich, said the situation had become more complicated. Another 11 cases had been reported in the past 20 days, he said. Therefore, to prevent the disease spreading, provincial agencies must strengthen supervision to prevent another fatality. 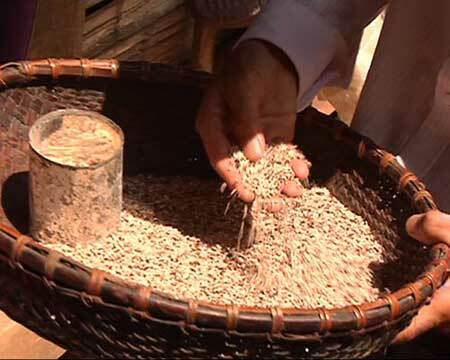 Agricultural experts were asked to give advice processing and storing rice to local people, Thich said. Residents must also be encouraged to have health check-ups as soon as symptoms are detected, so that they can have timely treatment, he added. Clean water must be supplied to people in affected areas, local leaders requested, adding that more research should be conducted so other causes of the disease are not overlooked. Health centres in Ba To and Ba Dien must be equipped with the necessary equipment serving for check-ups and treatment, they said. They also called for liver tonic and restoratives to be provided to residents. The disease, which causes skin to peel off feet and palms, was first discovered in the province two years ago. Son Ha is the third locality hit by the disease, with two affected people reported on February 15. Twenty-three have died of the disease.